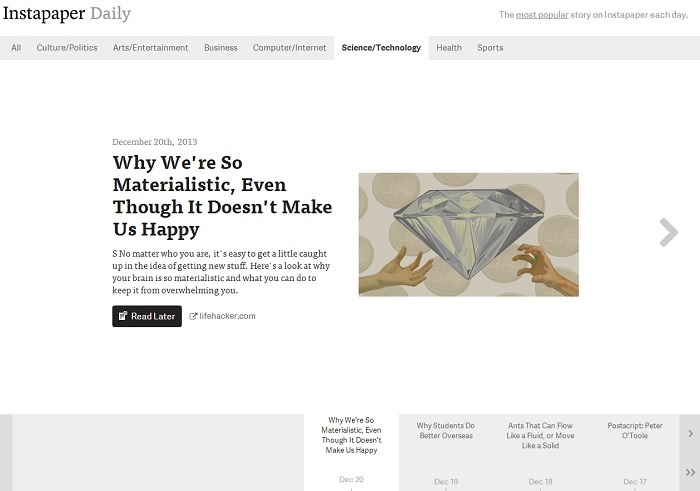 The folks behind Instapaper quietly unveiled a new service known as Instapaper Daily, which gives users the ability to read most popular stories saved on the cross-platform ‘read it later’ service online. If you’re unfamiliar with Instapaper, its a cross-platform service available on iPhone and Android, allowing users to save articles for later reading, more like Pocket, but with some extra features. The service looks handy and can be a good source of information for those who like to read the most popular stories on the web. The service with a very sleek and simple interface, with news stories listed by categories such as Science/Technology, business, politics, etc. It doesn’t only list the news for the current day, you can browse history as well from the timeline that is available at the bottom of the page. You can browse to any day in the year. By default, the site only lists the title and the excerpt of the story with a link to the website where it was published. Surprisingly, it also shows a ‘Read it Later’ link, giving users the ability to save the article in your Instapaper queue. Just head over to Instapaper Daily, and view the popular stories in 2013.